Hi Lites Motor Club: Wegmans Cruise, Real or Imagined? Somehow, you have wondered into what seems to be paradise. You see bluebird skies, with only an occasional white puffy cloud floating overhead, no threat of rain, and no fear of some weather related disaster. Where can you be? Your vision is blurred by images of brightly colored objects, each one emitting a distinctively strange, yet familiar sound. It is a song you have heard many times before but have not paid much attention to, but today you want to turn up the volume, take in every melody, every note. What are those sounds? You smell something unexpected. Your taste buds are awakened by the sensation that you are hungry, a craving so strong that you want any meat product cooked over an open, smoky fire. Where is that aroma coming from? Then, you are awakened from your semi-conscious world by the blaring sounds of some stranger blurting out the awkward phrase “the last four digits of the winning ticket are 7194”. Have you won something? Now you start to see familiar faces, some calling you by name, some offering their friendship with an extended hand. Some compliment you on the “nice car” you are standing next to, even though the car is not yours. You are now fully aware that you are at the Hi Lites Motor Club Car Cruise, hosted by Wegmans Food Market. You see Hi Lites members celebrating the perfect weather, rejoicing over the more than 50 vehicles that have arrived for the cruise, and complementing the staff of Wegmans for the fine “chicken barbecue” food offerings. The vehicles you see before you span 75 years of automotive history, with fine examples of stocks, customs, street rods, classics and other special interest types. You are happy that you took the time to come to this cruise, and promise yourself that you will be at the next Hi Lites Motor Club Cruise…. Because they do it right! The members of the Hi Lites Motor Club would like to express a sincere thank you to the management of Wegmans Food Markets. 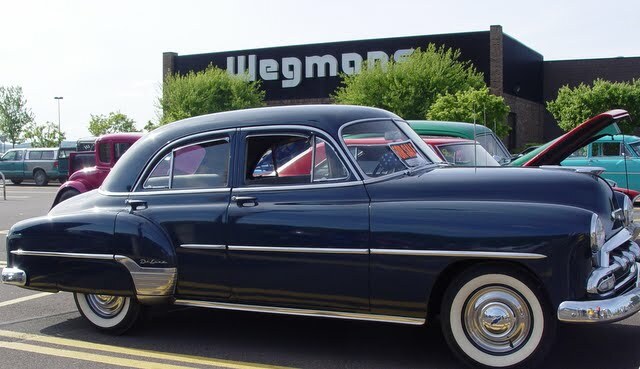 The Wegmans' store hosting this Hi Lites Motor Club cruise is located at 220 Highland Park Blvd in Wilkes-Barre, Pa 18702. The date of the cruise was Saturday, May 15th, 2010.